Apostrophe Catastrophes: What Can You Expect from a Place Called Tasti D-Lite? What Can You Expect from a Place Called Tasti D-Lite? 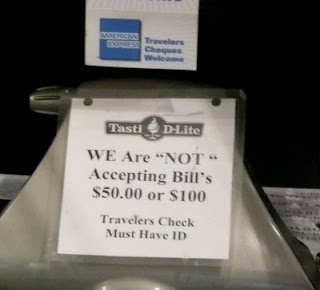 I wonder what Bill did to make them not accept his $50 or $100. I'll take it! Well, they're not really not accepting his $50s and $100s...only sort of. Seeing so many errors on such a small sign is going to make my head explode. Yes, the misuse of quotation marks to indicate emphasis is another catastrophe entirely! The tragedy of this error is this: if a newspaper headline says SENATOR "LIED" IN COURT, meaning SOME UNNAMED PERSON CLAIMS THAT WHAT THE SENATOR SAID IN COURT WAS A LIE, half the population thinks it means THIS NEWSPAPER WANTS TO EMPHASISE THE UNDISPUTED FACT THAT THE SENATOR'S STATEMENT IN COURT WAS A LIE. Tasti D-Lite sounds like a stripper name, doesn't it? Looks like Bill is trying to scam people with his counterfeit $50s and $100s.